Technically a composite is a structure with 2 or more components. A candy bar with nuts, nougat, and chocolate is a composite. Even traditional structural materials are often composites. Wood contains both lignin and cellulose and concrete contains sand and carbonate. 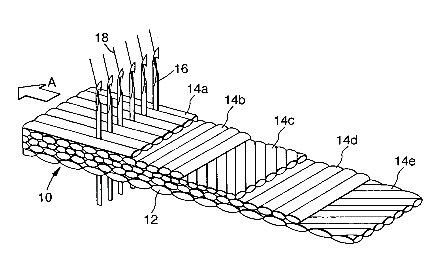 Most of the time when we think of composites, we think of reinforced polymers (plastics). The light weight and very formable plastic gains strength and stiffness through the addition of a higher strength particle or fiber. Among the many examples would be injection molded plastics, Sheet Molding Compound (SMC) or Bulk Molding Compound (BMC). The fibers or particulate are mixed into the plastic, which is then formed to the desired shape in molds under heat and pressure. Although the filler adds strength, these materials are usually used in decorative areas or as secondary structure that carry only relatively small loads. Composites based on continuous fibers are stronger than those based on short fibers or particulate. These composites are used in highly loaded structures. entations, then pressure and heat are applied to finish the cure of the resin. Often this final step is done in an autoclave. The prepreg tapes can be hand laid or laid robotically by an automated tape placement machine. Laying the fibers onto a tool, covering them with an impermeable film or the remainder of a hard tool and drawing resin into them. (Resin Transfer Molding or RTM). In filament winding and prepregs, individual yarns or tapes with the fibers aligned in only one direction (uni-directional) are by far the most common. Only a few yarns or tapes are laid down at a time, so the rate of adding material to form a structure is limited in each case. Which type of fabric should be used? 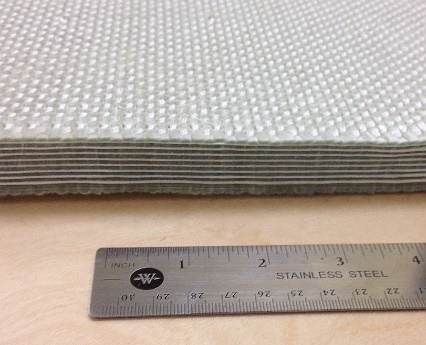 To form larger structures quickly, manufacturers use different kinds of fabrics. Each type of fabric has advantages and disadvantages. 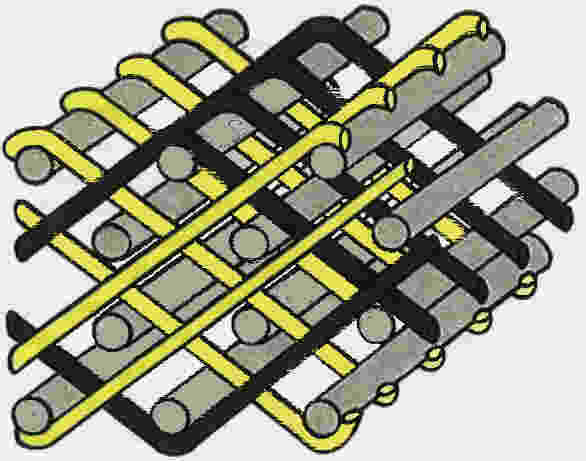 Traditional weaving (2D) is of course common and very well understood. A fill yarn is inserted in the gap formed by placing half of the warp layers up and half of them down. After the fill yarn is inserted , then the warp layers are switched, interlacing the yarns with each other. Much infrastructure exists to make 2D woven goods. The individual woven layers are relatively thin and the weaving architecture leaves a waviness in both the 0 and 90 degree directions (warp and fill) called crimp. To build thickness, multiple layers must be cut and arranged precisely. In the final composite, failures will initiate at the crimp points in the fabrics and in the layers between the fabrics (de-lamination). Non-crimp fabrics. Also called warp knit fabrics or stitch bonded fabrics or Non-Crimp Fabrics (NCFs). Another way to make fabrics is to knit them together. Using only small knitting threads to bind large yarn bundles, in a warp knitting process, small threads bind multiple layers of the fabric together. The threads do not carry the loads, rather they hold un-crimped yarns in place prior to the infusion of resin. This is distinct from sewing or stitching. Sewing and stitching also use looping threads in a knit-like pattern, but they bind two fabrics that have already been formed. In contrast, the warp knit process forms a single fabric. 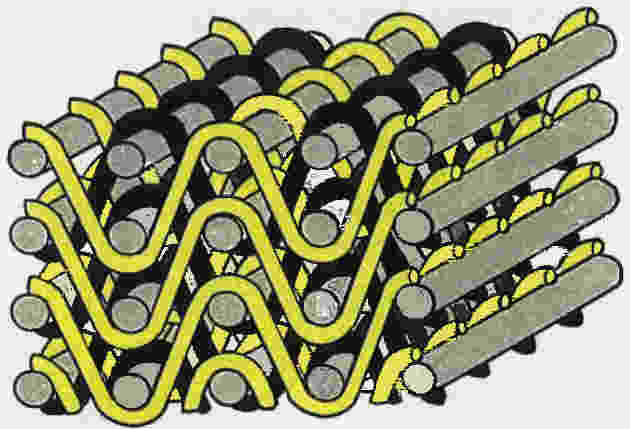 Some machines can form up to 4 layers of yarns. These layers can be arranged in a variety of directions, i.e. a 90 and/or 0 degree with other angles from 20 to 80 degrees. The lack of crimp in the warp knit fabrics has been shown to increase the final composite strength over a laminate made of 2D woven fabrics. The knitting threads are polymers and are necessarily very small. For most NCF’s, the threads have approximately the same strength as the plastic composite matrix around the fibers, so they offer no additional reinforcement. This means there is no reduction in their tendency to delaminate. Also, the knitting needles can pierce the yarns causing some damage and reducing the final composite strength. 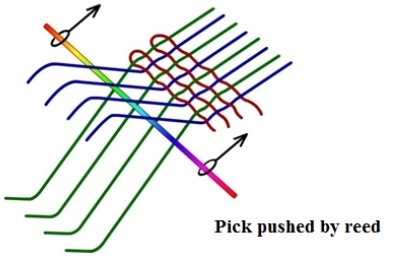 Using a single insertion 2D weaving machine, one can rearrange the fibers to form multiple layers that are bound by yarns that are joined by some warp yarns running between the layers. Most of the original 3D woven fabrics were made in this manner and a typical internet search for “3D woven” will largely return results based on these materials. Early research showed this to have good shear strength and to completely eliminate delamination, but the structure has much crimp and the strength in the in-plane (0 and 90 degree) directions suffered, as much as 30% lower. By adding a number of warp yarns that do not traverse layers (warp stuffers) some of the in-plane performance was regained. However using a single fill insertion and rearranging the individual warp yarns or layers to build the thickness leaves some crimp in both the 0 and 90 degree directions, as well as abrading the warp yarns, even the warp stuffers. The term orthogonal refers to reinforcements in 3 directions perpendicular to each other. This is the best description for the fabrics that Tex Tech makes. Both the warp and fill the yarns are virtually without crimp. To rapidly make very thick 3D reinforced fabrics, as many as 10 fill yarns are inserted at the same time with our unique multi-rapier looms. In the weaving set-up, the gaps between the individual warp layers are fixed in place, so the warp layer does not move during the weaving. Only the Z yarns are re-positioned vertically. This arrangement speeds the ability to make fabrics with large numbers of layers and leads to almost no abrasion of the warp yarns. Composites based on these non-crimp 3D orthogonal fabrics have been shown to have about 10-15% higher in-plane tensile strengths compared to an equivalent laminate of 2D woven fabrics. Since compression tends to separate layers, the advantage in compressive strength is greater, on the order of 25%. Research also showed that only 1-3% of yarn in the Z direction was sufficient to arrest cracks and prevent delamination. Lastly, the high order and lack of crimp leaves open resin flow channels, making infusion much faster than that with a laminate of 2D woven or NCF’s. Tex Tech Industries provides a wide range of woven, non-woven, and 3D non-crimp orthogonal components for use in a wide range of industries and applications. To learn more about working with Tex Tech Industries for all of your high-performance material needs, contact us today.